Why You Should Check It Out: For ballerinas and chicken dancers alike, Pure Barre is an effective way to achieve a full-body toning, stretching and calorie burning workout in under an hour. In addition to toning and elongating muscles through ballet-inspired movements, the high intensity, low impact exercise is a great way to improve posture, flexibility and balance. While the mental concentration required to make it through the challenging workout is intense, maintaining that focus allows you to reap similar mental benefits as those found through yoga. Beyond the health benefits, the Pure Barre studio staff is exceptionally friendly, and make a point to know students’ names in each class. Even when your fatigued muscles are shaking through a tough isometric hold, the community-centric studio vibe makes the whole experience positive. What Makes It Such An Effective Workout? The structured 55-minute class hits all of the major muscle groups, with fatigue-inducing segments focused on arms, thighs, hips, seat and abdominals. The easy-to-use equipment - 2-3 pound weights, resistance bands and a small exercise ball - are the only tools needed to quickly fatigue, slim down and tone every area of your body. With no running or jumping, Pure Barre stays low-impact on the joints. Each strength segment of the workout is followed by a guided stretch that provides the dual benefit of elongating and protecting muscles. Know Before You Go: Prepare yourself for a deceptively tough class your first time around. While the simple exercises may look easy at a glance, muscles are worked deeply, and poses are held extensively, which creates a truly challenging workout. To keep students - both new and old - on track, the diligent instructors provide regular form adjustment throughout the class. Two left feet? Not a problem: no prior dance experience is required. New students should arrive 10-15 minutes before the class begins to fill out paperwork and take a quick tour of the facilities. Come Prepared With: Acceptable workout attire includes workout pants, leggings or capris; and tops that cover your midriff. Pure Barre is done in socks, and sticky socks are highly recommended to avoid slipping. Bring your own water bottle for the filtered water available onsite. Changing rooms are available onsite, and Pure Barre sticky socks are available for purchase. On the Playlist: The constantly-changing playlist has a fresh mix of pop and dance music. A solid dose of Justin Timberlake will keep you motivated throughout the workout! Pure Barre is a total body workout that utilizes the ballet barre to perform small, isometric movements, which burn fat, sculpt muscles and create long, lean physiques. 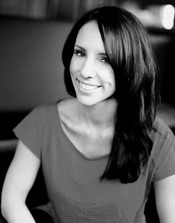 Pure Barre was founded by dancer, choreographer and fitness guru Carrie Rezabek Dorr. Carrie opened her first studio in the basement of an office building in Birmingham, MI in 2001. With no initial clients, staff, signage or even a bathroom, Carrie successfully grew Pure Barre into the dynamic company it is today. 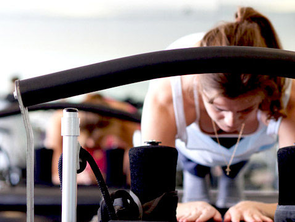 In July of 2009, Pure Barre became a franchise and has exploded in popularity, due to its extremely effective technique (which transforms the shape of a woman’s body in record-breaking time); friendly, high-energy atmosphere; and fun, motivating music. Pure Barre is more than just a workout; it’s a lifestyle. At Pure Barre, women share a sense of community, in which they are inspired and empowered by each other’s fitness and lifestyle goals. In addition to classes, Pure Barre also offers DVDs, equipment and exercise apparel.